High quality Ombre hair extensions with hair cut from Peruvian. The Ombre hair weave is made with 100% real human virgin hair, no tangling and shedding when brushing or running fingers through the hair. We have a wide range of sizes for you to choose, from 12 inches to 30 inches. 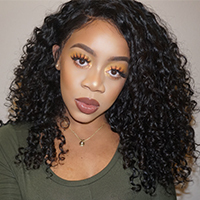 This Peruvian Ombre hair weave comes with 1 bundle, which guarantees to give you a thick and long hair, will perfectly blend with your own natural hair. The root of the hair has #1b natural color, while the shaft and end are in blonde #613. The body wave is one of our best-selling hair textures, this hair accepts straightening and any other styling ways you desire. For a full head to look full and thick, we suggest you wear 4 bundles in different length. Beautiful hair, The quality of this hair is the best. I love how it feels, your hands move freely through it. This is by far the best hair I have used. My professional stylist even got the information on it because she was in love with it, and wants to order some. I will definitely order this again and again. No more searching around for really quality hair. They got it right. hair is high quality Review by Hallize D.
I received this hair very fast, it is super soft and no tangle at all. I ordered the hair on Thursday and received it on Monday, shipping is really remarkable. The hair color looks very nice, hair is really soft and texture is amazing, will certainly buy again.